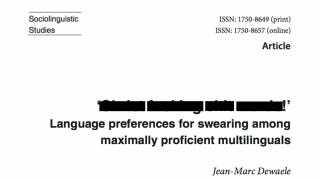 The present study investigates language preferences for swearing among two groups of multilinguals. The first group consisted of 386 adult multilinguals who filled out the Bilingualism and Emotion web based questionnaire (BEQ, Dewaele and Pavlenko, 2001–2003) and had declared that they were maximally proficient in their L1 and L2 and used both languages constantly. The second group consisted of 20 multilinguals with a similar sociobiographical profile who were interviewed about their language choice for the communication of emotion. A statistical analysis of the quantitative data revealed that despite similar levels of self-perceived proficiency and frequency of use in the L1 and L2, the L1 was used significantly more for swearing and L1 swearwords were perceived to have a stronger emotional resonance. An analysis of the quantitative data from the BEQ and the interview data confirmed the findings of the quantitative analysis while adding rich detail about the difficulties in deciding which language to choose for swearing.